Our American foxhound Bella has always been a finicky eater, but one morning I noticed something that was unusual even for her. She was picking up kernels of her dry food and dropping them onto the floor beside her dish. I thought back to my days working with horses. When they started to drop food from their mouths it was often a sign that they were having problems with their teeth. I could tell that Bella wanted to eat the food but something was stopping her. A visit to the veterinarian revealed that she was indeed having problems with her teeth. She had to have one tooth removed and also had her teeth cleaned while she was under anesthesia. According to the American Veterinary Dental Society (AVDS), 80 percent of dogs and 70 percent of cats show signs of oral disease by age three, often indicated by bad breath, a change in eating or chewing habits, pawing at the face and mouth and depression. To address the significance of oral health care for pets, the American Veterinary Medical Association (AVMA) sponsors National Pet Dental Health Month in February. Besides causing receding gums and tooth loss, bacteria in the mouth can enter the bloodstream, potentially infecting the heart, liver and kidneys, which can be potentially life threatening. 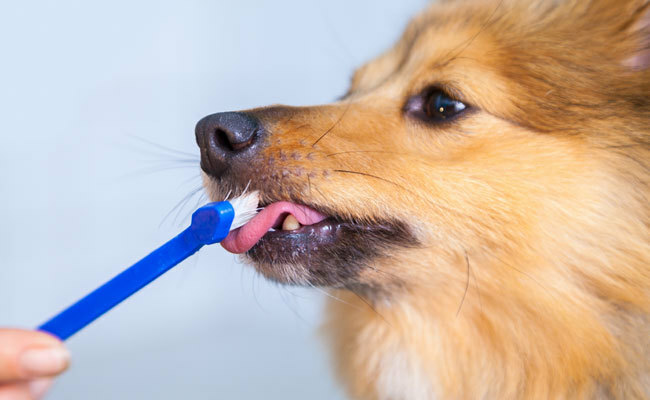 Although daily tooth brushing is advised for dogs and cats, only 2 percent of dog owners follow through according to the AVDS. Bad breath and yellowing teeth are two of the earliest signs of dental health problems in pets and if left untreated these symptoms can develop into periodontal disease or gingivitis. Just as the public has come to realize that their own oral health is linked to their overall health, veterinarians want people to understand that dental health care is essential to maintaining the overall health and wellbeing of the family pet. 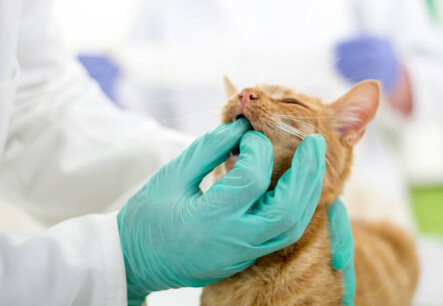 Prevention of dental health problems is as simple as following a dental care regimen at home and following up with regular checkups with your veterinarian, say experts at the New Jersey Veterinary Medical Association (NJVMA). Getting your dog or cat used to having his or her teeth cleaned at home should ideally be started when they are young but pets of all ages can learn to adapt to this routine. Be sure to use toothbrushes and toothpaste made especially for pets and be gentle when brushing, taking care to get the insides and outsides of all teeth. In order to train your dog or cat to tolerate regular tooth brushing, start by massaging the animal’s gums with an appropriate pet toothpaste. Poultry-flavored toothpaste is very popular and most animals love paste. This process should be repeated approximately two to three times a week. Special foods, along with dental chews, rawhide, dental bones and other healthy products that pets consider treats can help keep teeth white and free of disease.